As I have mentioned in my posts earlier I started with early learning when N was almost one and regret not starting it earlier but when I look back and see his videos and pics I realise I was on it since he was born.Yes absolutely without even a single iota of knowledge about early learning ,N was into early learning from the day one or may be before in my tummy while he was kicking he was learning something new. A new born is born with the natural ability to learn and needs no push to do so.As a parent we only act as facilitator and care provider.So lets get started with early learning in early phase of infant life first. Yes it starts from here and parent has a major role in providing the environment. A safe tummy time under adult supervision is a great time to learn for infants.They learn how to keep their head up for longer time and make their neck strong enough to hold the head. So the fact is to stimulate them and not over simulate; babies love black and white and colours can be over stimulating.So give them some black and white book for the motivation to lift the head while tummy time. I bought a simple gym and started from the second month although the weather was cold and layer of clothing was a major factor but still the gym was stimulating enough for body movements. In fact more than gym my son was interested in moving fingers in front of his face.He will move his hands and legs with excitement when I would twinkle my fingers in front of him. I never used a crib during the initial months it was only after my son was 5 months old that I invested in a cot.But still we got few hanging and I used to used that in his play area. One of the most popular and a game which 100% brings those giggles on the tiny lips.We played a lot of peek-a-boo and till now it is my sons favourite. A skin to skin does wonders in soothing what it has to do with early learning well!! Attachment with the care giver parents in general is very important and emotional bonding when established can give a long term emotional stability and sense of security . This is important for the emotional well being. For first few months I was too scared to do Massage of my baby and hence the act was outsourced.But eventually I realised I am losing out on bonding time with my baby and I took over. Apart from many benefits it helps in forming a routine and hence better sleep. Babies they love listening to your voice as they recognise your voice from the womb.They start differentiating voices from an early age.Hence language development starts way ahead from what we can imagine.Talk normally and avoid making baby voice with mushy talks all the time (I know that irresistible but still ).These little talks will aid a lot in language development in future. Invest in some finger puppets or best just DIY. Tell them stories and talk more. Invest in some good wooden rattlers ,babies first learn to move their head towards sound and then after sometime to grab the object and rattlers are best for that. Put a mirror near the floor bed or simply show them the mirror during tummy time.Babies they love watching their reflection in the mirror .We had baby eisenstein mirror me book and N use to love it.Now we use this book to make funny faces. 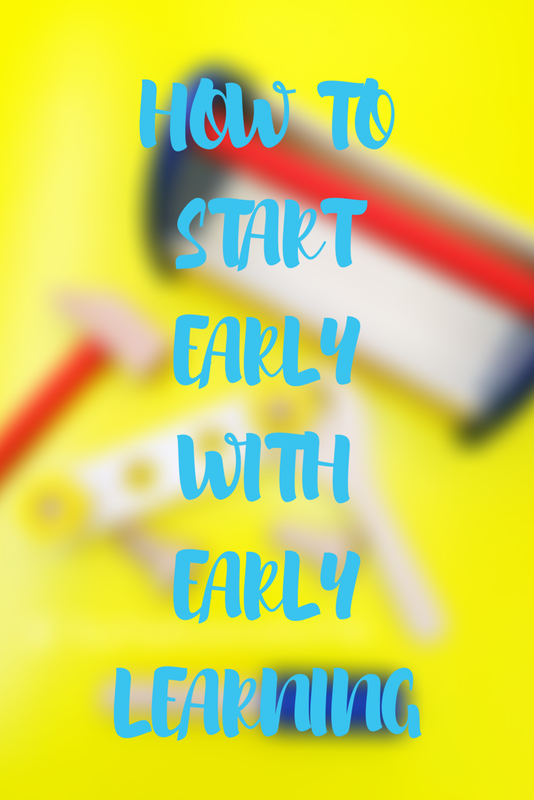 So these were few pointers on starting with early learning at infant stage and my next post in the How to start early will be on babies from 6-12 months.